I knew within 30 minutes of this day how things were going to go today, literally. The morning was cool and wet and we were about a couple of miles (if that) away from the church we had stayed at last night and my back tire blew. Of course, I had a new tube on me, but it was too big. I stood on the curb thinking "oh, so this is how this day is going to go...I see..." Thankfully sweep was right behind me and had spare tubes and a nice travel pump and they gladly fixed my tire for me. On we went, at most 10 more miles, and then we hit this hill, a never-ending, hill. After a few minutes of the ascend and my breathing got out of control (this will be something I will work on figuring out for future rides). As I mentioned, it was a cool and wet morning, perfect conditions for my asthma to get out of control, and quickly, and that it did. I didn't think to use my inhaler during the ride (as I just use it pre-workouts...but it's called an emergency inhaler for a reason...did I mention I can be stubborn? ), so I tried to push through and conquer this beast. It was one of those hills where you couldn't see the top, it just kept going UP UP UP. The bottom half was okay, but once my breathing was out of control, and it didn't take long because the incline was so steep, I had to stop about every 20 feet to catch my breath. I wish I were exaggerating. One of my best friends was riding sweep that day and he wisely encouraged me to just go as slowly as I needed to and that it wasn't a race. Well between my asthma getting the best of me and the steepness of the climb sending my back into pain way before the now familiar 50 mile mark, I was filled with two emotions upon finally reaching the top: elation and immense frustration. I asked the team if they would mind going slowly for a bit because my back was already hurting, to which they gladly agreed and suggested I take the lead and set the pace. So I lead, and was crushing it at 18-20 mph, so much for going slowly and not racing (racing what?! I have no idea, but clearly I was racing something). I was pissed that I had had to go so slowly the first part of the ride so far and I was so frustrated with my back pain and my asthma getting the best of me that I did the most rationale thing and rode as fast as I could away from that bloody hill. By the time we finally got to our first stop around mile 30, I was physically, mentally and emotionally a mess. I knew I needed to pull myself off the road. Half of me didn't want to imagine that I needed to since I was GOING to get to Chicago on only 2 wheels, and the other half of me knew that if I didn't pull myself off, the rest of the day was going to mirror the first part of today's ride, and I had no interest in putting the rest of our team through that. You could say I gave up, and perhaps I did. I could've pushed through and forced myself to get over it. But on the other hand, I knew we still had 3 more full days of riding ahead of us, and I wanted to make sure I could at least ride part of the remainder of the 3 days to Chicago. So, in the moment I did what I felt like was the best decision and pulled myself off the road. Tonight, during team devotions, I sat there feeling discouraged, defeated, frustrated and like a failure. And God met me in that moment and said, "I asked you to go on this trip. I did not say you had to ride every mile from Minneapolis to Chicago. Your obedience to simply going on this trip is all I asked for. And look at the people who are on this trip because you did what I encouraged you to do. You've already succeeded in doing what I wanted. I don't care if you ride all the way to Chicago or not on your 2 wheels, that's completely up to you. "And in that moment it was settled and I was reminded that God's word for me this year was "play." So for the next half of this trip, that's what I'm going to focus on, "playing." Minneapolis to Chicago: we made it! Clearly the tour started to take more and more out of me as the week went on as I'm just now catching up on posting. I can honestly say, I haven't been this physically sore since two-a-days in high school, especially during pre-season for soccer. Wake up, go to practice for a couple of hours, go home, eat lunch, veg out (how about those daytime soaps? ), go back to soccer practice for two hours, go home, eat, sleep, repeat for two weeks. Well, this was like the adult version of two-a-days, except it was all day, literally. I discovered the value of foam rollers on this tour, not too mention honing my nutritional skills. Let's just say, one day, I realized why so many endurance athletes prefer liquids and gels to solid foods. One post lunch ride left me with a stomach cramp that made me forget about my back pain. This past week showed me how quickly a community can become just that -- an authentic closely-knit community that truly took care of each other and made sure no one was ever left wanting, nor behind. Honestly, I've never experienced anything quite like it, the closeness of this team. And I've been on countless short-term trips over the years. Maybe it was the daily focus of the people in Thailand for whom we were riding and raising support. Maybe it was the daily prayer and intentional evening debriefs. Maybe it was the fact that we were all emotionally, physically and spiritually exhausted by day two. Or maybe it was all of the above. This team left Minneapolis one day and six days later it all arrived in Chicago, together. And having raised over $22,000 to help meet the needs of those most in need along the Thai/Burmese border. And having become a closely knit community in the process. And having each been changed individually in the process. One thing I knew about myself was that I don't like physical pain and I tend to avoid it at all costs, but I learned that I can push through much more than I imagined I could. And sometimes on the other side of perseverance is more than we could have ever hoped for or imagined. This will take me further in life and service of others farther than I even know... Following Jesus always leads us to laying down our lives for others. I feel like I'm a little closer to knowing what that really means. 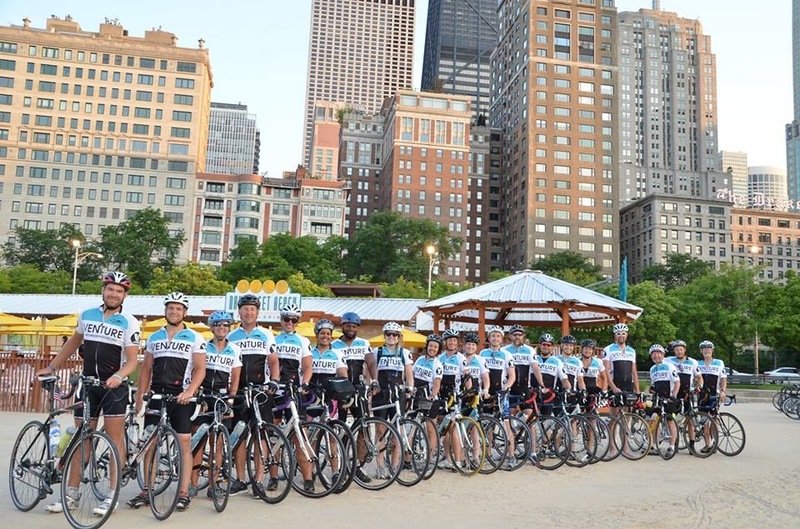 Day 2 of the Midwest biking tour presented a fun opportunity for most of us: our first century ride (100 mile ride)! I was definitely excited about his and definitely apprehensive about this. The furthest I had ridden was the day before, when we rode about 65 miles. I was a little apprehensive about how my back was going to do, but it felt fine at the moment. Plus Jon's wife had packed essential oils for him that he was willing to share, so I figured that would go a long way. Since we stayed in a home that didn't have coffee, the first stop for those of us whose drug of choice is caffeine, was the nearest Caribou. It also had to be the cutest Caribou Coffee I've ever seen. The next 100 miles were filled with huge climbs, gorgeous scenery, and AMAZING speeds on the down hills. I clocked 40 mph on my bike on one down hill, and let's just say I was praying a lot that cars nor slide outs would ruin that long run down...I love speed...which is why I will take biking over running any day (let's just call it what it is...I don't really run, I lope...my asthma, allergies and aging are proving more prohibitive than I ever would have imagined. Please, if you are in your 20's do it all!! The 30's are when you start falling apart. Trust me.). It's also why I need hobbies that provide speed because if you haven't noticed, life, well...at least mine is more of a marathon pace and nothing happens when I WANT it to. God and I have lots of talks about this. And God usually wins. When I "win" it never turns out well, so it's not really a win. But it usually takes me a bit to concede and realize things would have turned out better if I had let God's best rule. The thing about God though is that God will let us have our way whenever we want and we can run into as many walls as it takes us to realize God's best is always better than what we hope, dream or imagine. Someday, I hope to be able to believe that enough to actually live it out... Until then, I imagine I will run into many more walls and will go running to God to be consoled and reminded to stretch my patience out just a bit longer next time. The first 50ish miles of this day were brilliant. And then the inevitable, my back pain set in again. So, with 50 miles to go, I needed to stop and stretch about every 7-10 miles depending on how many hills we had and how much I pushed myself. The first couple of times we had to stop, I was okay with it. I didn't mind being the reason we had to stop. But I wanted to push myself til I just couldn't bear the pain any more and then stop. Well, I went too long one time and literally getting down on the ground was so painful I couldn't hold back the tears. So there I lay on my back in the middle of who knows where Wisconsin in excruciating pain and I guess, trying to save face and from being humiliated. So from behind sunglasses (so my team couldn't see how much pain I was in) I told them I could just wait for sweep (y'all know how well that went from Day 1) and that they should just go ahead. To which Fred responded, "No. We are a team and we will stick together and all finish as a team. You of all people should know that, you're the Missions Pastor. Plus, I'm always ready for a bathroom stop and these stops remind me to drink more water." Everyone else chimed in and agreed. So, the rest of the day was spent riding together across Wisconsin with stops about every 45 minutes so I could stretch my back and everyone could take bathroom and water breaks. And finish together as a team, we did. If I'm being truthful, I'm still unsure why it's so hard for me to be the reason to stop. If it had been someone else, of course I would stop for them, as many times as they needed and thought nothing of it (and probably even enjoy a reason for the break). But when it comes to me, I don't want to be the reason people have to stop. I don't want to be the reason people have to slow down. I don't want to be the "weakest" link. Perhaps it's my age old perfectionist tendencies. They've gotten better over the years, but clearly I still hold myself to unrealistic expectations and always want to be great at everything, otherwise, why do it (I know, I know, horrible belief system, but I'm just being real). Perhaps this is the reason my word for the year from God is "play." Not perform, not excel, not pray, not lead, not seek, not follow, but "play". Last week, 20 of us left Minneapolis and bound for Chicago on nothin but 2 wheels and a comfy seat (or not so comfy in some people's cases). I'm not going to lie, I honestly believed the 503 mile trip was going to be relatively easy. Okay maybe not easy, but very doable, ridiculously fun and I'd probably take lots of cool pictures of things we'd see along the way (for anyone who's done a bike tour before you are probably laughing your head off right now). I mean, I'm athletic, I'd been riding my bike at least 4 times a week for several months (mind you I'd really just began road biking in March...4 months earlier), I'd done a triathlon the previous fall (the first time I'd ridden 18 miles consecutively in my life mind you) and I knew we'd be stopping every 20-30 miles for a snack and water break. Not too mention we were riding in the Midwest, quite possibly the flattest area in the world, right? What was the big deal?? Well let's start with the lesson I learned day one, 50+ miles in to a 70+ mile day. After lunch I lead our pace line, cruising around 20 mph and loving the wind in my face, the amazing pace and the fun rolling hills (turns out the Midwest isn't flat, at all...come to think of it I can't even get out of my neighborhood without hitting a hill...I have no idea why I didn't think of this earlier). Around mile 50ish, I was in the back of the pace line doing 30% less effort than the lead and suddenly we came along a long rolling hill and my back started spasming. Like, my entire lower back was convulsing (it was like there was an alien trying to push out my skin). Needless to say, I was not going to make it up that hill without stopping. I was stunned. What on earth was wrong with me? I mean, I'd done two 47 mile rides before this trip! So I convince Eric, the guy in front of me, that I was going to just stop and wait for sweep (the last two riders who made sure no one got left behind and helped with flats and that sort of thing) knowing I couldn't keep up that pace any more cause my back was killing me. I laid down in the grassy field, thanking God for a beautiful place to rest until I could join the end of the pack. Needless to say, I scared 2 passer-biers to death leading them to believe I had died on the side of the road (I'm not joking. I opened my eyes to a pale-faced man running towards me convinced I had died. I apologized profusely and suppressed my laughter since he was clearly in duress.). Two friends came back from the front group and convinced me to go ahead with them and not wait for sweep and that they would stop with me whenever I needed to stretch. Lessons from day 1: don't lie down in a ditch on the side of a road and 2: true friends will not only come back and get you, but also go at your pace so you don't go alone (on the bike...and in life).